A list of U.S. Army servicemen reported either killed or missing during World War II. 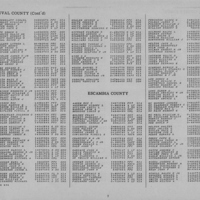 This particular page shows servicemen from Duval and Escambia Counties, Florida. A notable soldier listed in this record is Captain William H. Smith (1920-1945). Smith was born on November 28, 1920, as the youngest of three children to John Seward Smith and Eva Wilds Smith. The Smiths lived at 419 Smith Street in Jacksonville, Florida. Three days before his 20th birthday, Smith enlisted in the U.S. Army to serve during World War II. He became a member of the combat infantry of the 63rd Infantry Division's 255th Infantry Regiment. Capt. Smith was Killed in Action (KIA) on January 3, 1945, in the Ardennes region, repelling German forces during Operation Nordwind, the last German offensive of the war. After his death, Capt. Smith was awarded the Combat Infantrymen Badge, effective January 2, 1945, as well as a Bronze Star and Purple Heart for his sacrifice. He is buried at Epinal American Cemetery and Memorial in Dinozé, France. 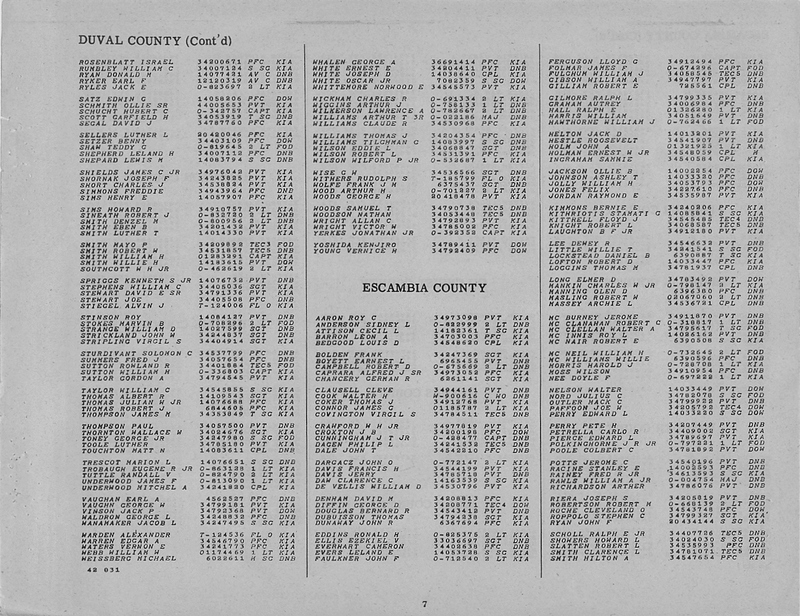 “World War II Honor List of Dead and Missing Military Personnel from Duval and Escambia Counties.” RICHES of Central Florida accessed April 26, 2019, https://richesmi.cah.ucf.edu/omeka/items/show/9329.